Arsenal superstar Mesut Ozil was involved in a light hearted prank on supermarket giants Tesco via Twitter as a fan pictured the German indulging in some grocery shopping at on of their stores. @tescomobile why is there a goat in one of the mobile sections in one of your stores? The picture emerged on Sunday, 24 hours after Ozil helped Arsenal secure their second successive FA Cup final with two assists to Chilean star Alexis Sanchez as the Gunners defeated Reading 2-1. Tesco’s twitter accounts have gained a reputation for initiating some ‘banter’ of their own but it was time for them to be given a taste of their own medicine by a humorous Arsenal fan. The Gooner warned the Tesco mobile account that a ‘goat’ was roaming in one of their stores, to which they responded with a sarcastic tweet. ‘Goat’ is an acronym for ‘greatest of all time’, which is what the Arsenal fan was referring to upon positing a picture of Ozil in the fruit and veg section. 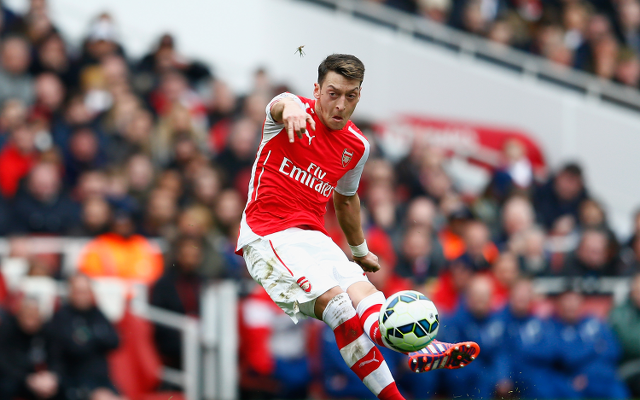 Signed for a record £42.4m, Ozil is enjoying his most consistent period since arriving in the Premier League.